Many Palestinian labourers from the Shuafat refugee camp across the barrier work on construction in the Israeli settlement Pisgat Zeev in East Jerusalem to the right. Credit: Jillian Kestler-D’Amours/IPS. RAMALLAH, Occupied West Bank, Sep 25 2012 (IPS) - Hassan Hader’s application for a permit to work in Israel has been rejected four times. Now waiting to hear back from the Israeli authorities on his latest attempt, the 52-year-old father of five said he has no choice but to keep applying. “I wasn’t even given a reason why my application was rejected,” said Hader, who worked at a quarry in the industrial zone of Ma’ale Adumim, one of Israel’s largest illegal West Bank settlements, for nearly 20 years before losing his job last year. Hader lives in Ramallah and holds a West Bank-only ID card. He told IPS that he has no viable job opportunities in the Palestinian labour market. With his family’s savings slowly running out after over a year without work, he said that getting a permit to work in Israel is his only option. Recently, local media reported that the Israeli government plans to increase the number of work permits allocated to Palestinian labourers from the West Bank. 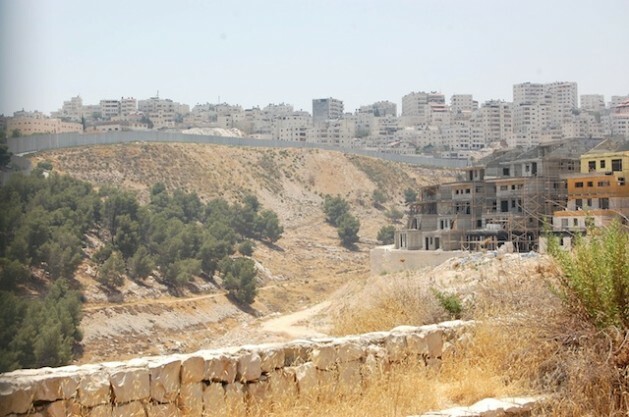 In an e-mail to IPS, Barak Granot, spokesperson for the Israeli Ministry of Industry, Trade, and Labour, confirmed that an additional 5,000 permits would be issued to Palestinians to work in the Israeli construction industry. “The increase was decided in order to assist and ease the stress and lack of employment in the West Bank on one hand, and to ease the shortage of workers in the Israeli construction sector on the other hand. This decision was made according to the government policy to favour Palestinian workers, rather than other foreign workers,” Granot stated. The Israeli Civil Administration (ICA), the Israeli military body that controls over 60 percent of the occupied West Bank, echoed this sentiment. “The increase in permit granting is supposed to reduce the activity of the foreign workers who stay in Israel for long periods, and might settle here. As opposed to them, Palestinians arrive in Israel (during the) day and usually leave in the evening,” the ICA told IPS in an e-mailed statement. As Israel imposed restrictions on Palestinian freedom of movement after the outbreak of the second Intifadah (Palestinian uprising), migrant workers from the Philippines, China, Thailand and Eastern Europe, among other areas, gradually replaced the Palestinian workforce. Recently, however, an influx of migrant workers and asylum seekers in Israel has caused panic among Israeli leaders, who say the presence of non-Jewish foreigners threatens the country’s Jewish character. In response, the government has decided to gradually lower its quota of work permits for foreign workers, and has placed more limits on these workers’ freedoms once in the country, including binding caregivers to their employers and to specific places in Israel. The Israeli Civil Administration told IPS that there are currently 57,095 Palestinian workers employed in Israel and in Israeli settlements, and that permits for 8,000 more Palestinian workers would soon be approved, in addition to the 5,000 extra permits for construction workers. Palestinians must be over 26 years old, married, and must pass a security check to be eligible for the permits, the ICA stated. According to an April 2012 World Bank report titled ‘Towards Economic Sustainability of a Future Palestinian state’, between 2000-2004 the number of Palestinians working in the Israeli labour market fell from 26 percent to less than 12 percent. In 2010, approximately 14 percent of the West Bank workforce was employed in Israel or in Israeli settlements. Palestinians living in the Gaza Strip, however, have been barred from entering Israel or the West Bank for work since 2006. Israel also stops almost all Palestinian products from being exported from the Gaza Strip. “Gaza is undergoing a process of de-development where the economy is being dismantled. It’s an economy that is not allowed to be productive. Certainly allowing workers in Gaza to return to their jobs in Israel would provide a boost of hard-earned income to families who need it desperately,” said Sari Bashi, director of Gisha, the Israeli legal centre for freedom of movement. According to the United Nations, the unemployment rate in the occupied Palestinian territories was 26 percent in 2011. Unemployment among youth, aged 15-29, was even higher, sitting at 35 percent and 53 percent in the West Bank and the Gaza Strip, respectively. “There needs to be recognition that Israel has obligations to those that are under occupation and who are trying to make a living,” Bashi told IPS. Gisha estimates that approximately 60,000 Palestinians from the West Bank – half with permits, half without – enter Israel every day for work. A better-regulated system could reduce the risks involved for Palestinian labourers who enter Israel illegally, Bashi added. In late July, a Palestinian man was killed and three others were wounded when Israeli soldiers manning a Jerusalem-area checkpoint opened fire at their car which was carrying over a dozen Palestinian workers trying to enter Israel without permits. Hassan Hader knows people who enter Israel illegally for work, but the consequences of getting caught – both for himself and for his family – deter him from even trying. Mr. Hader’s request, now for the fourth or fifth time, is one that should be taken seriously by the Israeli government. He fits the criteria, and does not pose a threat to Israel. Certainly it would seem more reasonable to have someone like Mr. Hader be permitted to work on behalf of his family then a foreigner whose intent might be questionable. The Jewish nation has suffered, but so has the Palestinian nation. God wishes for us to help our neighbors and to work in and for peace. He does not wish us to allow idle hands that cannot work, nor does he wish us to cause circumstances whereby our neighbors go hungry or without shelter, or their basic human needs being met. With God, there are no barriers. It is man who designs and implements barriers, sometimes hurting those very people that God would have us reach out to. Israel needs to find a workable solution and possibly re-evaluate their method of doing things and possibly implement changes as need be that will satisfy all of God’s people, and not just those we pick or choose for our own purposes.